What can you do with popcorn and hot chocolate? Help save the endangered island fox! 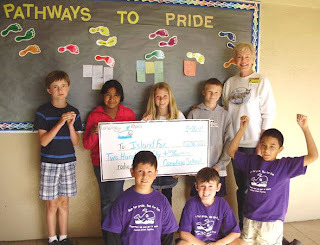 Fourth grade students at Canalino Elementary School in Carpinteria, California have become Island Fox Ambassadors. 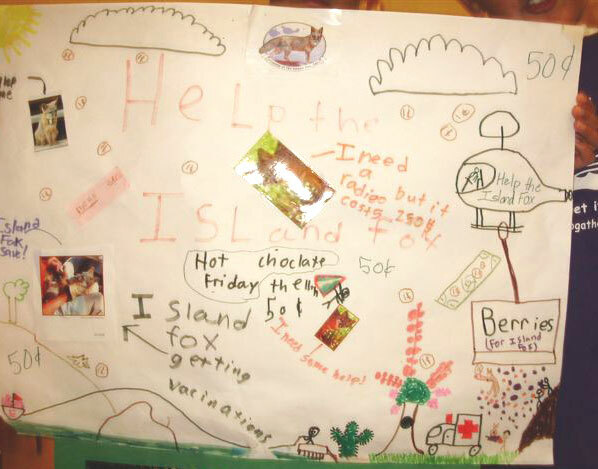 They made posters to increase awareness about the endangered island fox and they raised funds by selling popcorn and hot chocolate at a school movie night. The fourth grade students learned about the island fox through their teachers and a presentation by Friends of the Island Fox educators. (For information on Island Fox classroom programs call 805 228-4123 or e-mail admin@islandfox.org). Working together the Canalino students raised a large enough donation to support a radio tracking collar for an island fox. Radio tracking collars are vital to monitoring island fox welfare across the Channel Islands. More on GPS collars. The “Canalino collar” marks radio collar #65 supported by generous donations to Friends of the Island Fox. Part of the island fox’s rapid recovery from the brink of extinction is due to the partnership between scientists, conservationists and the public. Friends of the Island Fox proudly adds the fourth grade students of Canalino Elementary School to our list of Island Fox Ambassadors. The island fox is a California treasure and it needs devoted conservation ambassadors like these students to safeguard its survival into the future. You can make a positive difference too, by supporting island fox conservation through the donation button at the top of the page. Follow the adventures of Tani, an island fox on Twitter @ ifoxtweet, see box to the right, or Find us on Facebook. May 24th will mark a landmark day for this island fox pup. You won’t want to miss it!